The present scanning study is part of Canadian Institute for Health Information's Primary Healthcare Survey Project. It has been done in order to support the development of an organizational questionnaire that can be used to assess the organizational attributes and delivery of primary healthcare in all parts of Canada. This study aims to facilitate primary healthcare research by presenting the process which led to the elaboration of a questionnaire designed to measure organizational attributes of primary healthcare. This questionnaire, developed for the Canadian Institute for Health Information project, is different from the two accompanying instruments that help to evaluate healthcare provider practices and patient experience. It is important that decision-makers, managers and healthcare providers have access to reliable and comparable data generated by assessments of the organization and delivery of PHC, through questionnaires that properly measure PHC organizational attributes. The large number of organizational attributes defined in literature, as demonstrated by the work of Haggerty et al (2007), Hogg et al (2008) and our study suggests that the task of conceptualizing PHC organizational attributes is not an easy one. In fact, many attributes must be considered for an indepth analysis of the organization and delivery of PHC. We have seen that some organizational attributes are less measured while others are addressed in almost all the questionnaires selected for this scanning study. As our results showed, the Evolution Project survey excelled. It was one of the few survey tools selected that was developed based on four important organizational dimensions: vision, organizational structure, level of resources, and clinical practices characteristics. 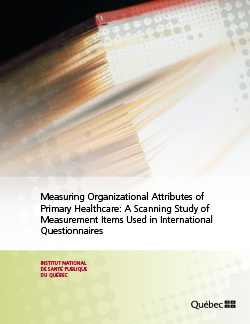 At the time of this study, this questionnaire has been administered and validated twice within the context of a large study on organizational models and performance (2005 and 2010) in the province of Québec, Canada. The fact that it was used in a Canadian setting is particularly relevant in the context of this study as it was used for the preparation of a questionnaire measuring PHC organizational attributes for the Primary Healthcare Survey Project of the CIHI.